Best High Mileage Oil Success - Van goes 930,599 miles on AMSOIL! AMSOIL Dealer John Schlimmer of Greenville, Ohio drives a 1999 Chevy G-3500 Express delivery van over the road between 110,000 to 120,000 miles a year. When Schlimmer learned about AMSOIL synthetic motor oils and lubricants in 2000, he installed AMSOIL products throughout the vehicle’s drive train. He first installed AMSOIL 0W-30 Synthetic Motor Oil and went from changing his oil every two weeks to once every three months. He also installed an AMSOIL oil filter, AMSOIL Multi-Purpose Synthetic Grease, Automatic Transmission Fluid, and AMSOIL 75W-90 Synthetic Gear Oil in the vehicle’s differential. Schlimmer drove the van until October 2007, when a valve keeper broke on the 5.7 liter, 350 gasoline engine. Schlimmer said the actual mileage on the engine did not factor in more than 6,000 hours of idle time. It had 930,599 miles on it. Schlimmer sent the engine to AMSOIL INC. for analysis. Analysis showed that a valve keeper had worn out, causing the valve to become wedged in the chamber. The problem with the engine was not oil-related. Measurements taken against manufacturer’s specifications indicated the engine was still in useable condition. In each of five categories, the engine tested within 1 percent of manufacturer’s original specifications for the engine. (See chart below) Schlimmer replaced the engine and continues to drive the van with the original transmission with more than 1 million miles of service. The engine valve train shown here is clean, with virtually no deposits in an area that typically has sludge and heavy carbon buildup with conventional motor oil. The inside of the valve cover is very clean with almost no deposits. The top of the head reveals the rockers and valve springs have almost no deposits. Note the part numbers still are visible. Based on measurements, the engine could be put back in service. The cylinder wall reveals no noticeable ridges. Note the crosshatch marks still are present. The uncleaned oil pan shows no sludge or heavy varnish. The engine oil pump pickup screen is very clean and has no deposits. The lower crankcase shows no deposits. The upper main bearing shows very little wear. 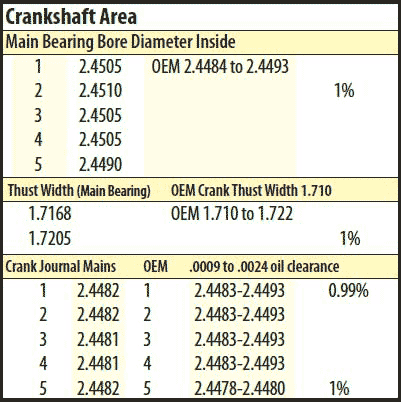 All of the main bearings from the engine are in useable condition, according to the analysis. Another great Amsoil dealer: Amsoil Bloomington, Illinois. Visit us if you live in Coral Springs.